On paper the changes may appear simple, but in steel it is a whole different story. I always try to make smart choices when designing for others – I like to set the builder up for success. It is always better to work smarter, rather than harder. And while I have created many chopped tops, one-off fascia, tail panels, hoods, and other custom body mods – I see this project as a good exercise for me as an artist and builder. This will be the ultimate proof to see if what I create can be built to look the same in the real world as it does in the virtual world. I have a basic design started by looking at the profile view of the car. The modifications break down in the following manner. The roof is cut completely off. I plan to make some sort of constructible top later, much like English sports cars utilize. Rather than a folding top, it goes together kind of like a tent and fastens to the windshield posts and snaps across the back. Three inches is to be taken out of the length of the front fender. This will be done in two places, at the wheel opening where it is flat and at the back of the fender along the top along the cowl. Since I am sectioning the car, the fender will be spilt horizontally and allows me to shorten it in two different places along the top and bottom of the split. Most of the shortening will be done by converting the car from a four-door into a two-door. This seems relatively simple, but I am not just eliminating a door. Since the front part of the front door fits the fender and has hinges, I want to retain those parts. Similarly the back part of the back door fits the quarter panel and has striker and latch system. Combining the front of the front door and the back of the back door seems to make sense. To make thing a bit easier, the length of the door is based on the length of the front door side trim. This was done so I don’t have to customize the trim. 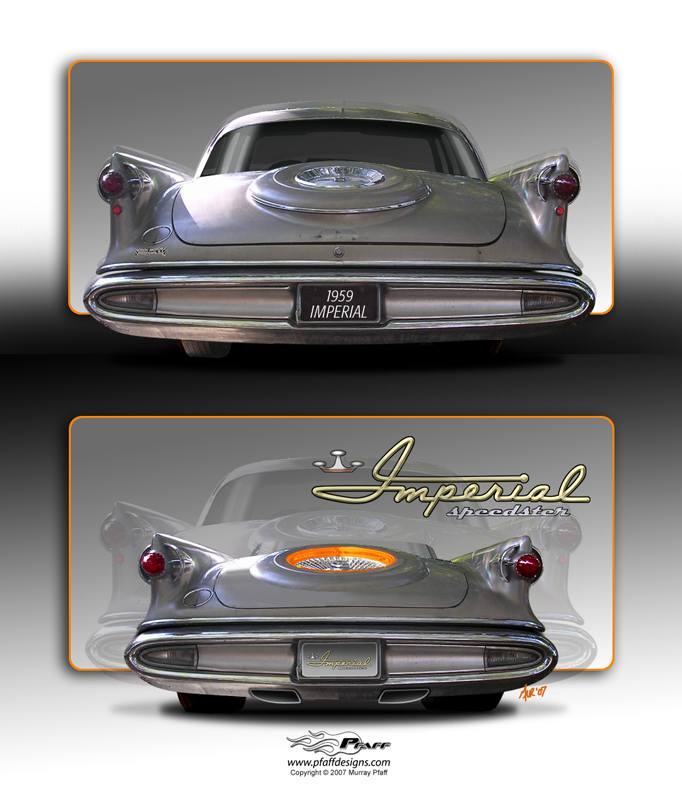 The plan to convert a 1959 Imperial Sedan into "The Imperial Speedster". Similar to the front fender, the rear quarter panel will be shortened in two places. Above the section line a foot needs to be removed at the leading edge near the door jamb. Below the section line, metal is taken out of the overhang behind the wheel opening. The dog leg and wheel arch are left alone. In narrowing the car a few things become apparent. I need to leave the fenders alone – too many shapes going on and I don’t want mess with them. Proportionately, the hood is too wide and could benefit from being narrowed. The center peak is a great feature, so four inches will be removed from either side. The front bumper is three pieces, so by removing the main bumper and utilizing just the bumper ends removes mass from the front end. 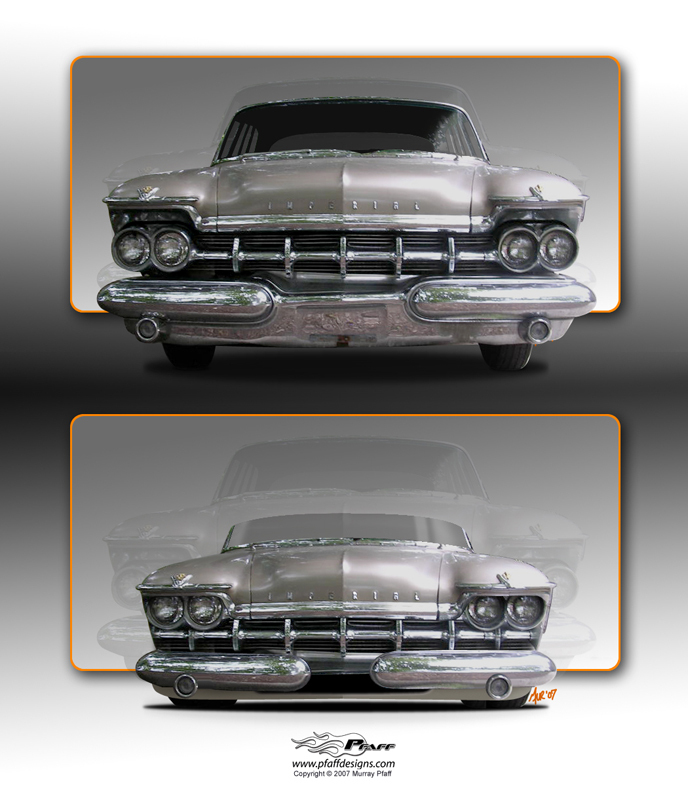 The stock car has a goofy look from the headlights floating in space. By moving them up into the fender tops and allowing the fender to cut them off it gives the car a “furrowed brow” evil eye look that the new BMW’s and even Dodge’s do so well. Next the grill bar is tucked up under the edge of the hood and has to be extended under the headlights. It is the only part of the car that needs widening! Changes to the front end. Around back the car can be narrowed right down the center after the spare tire blister, also known as the “Flightswept” trim, is removed. That can be welded back on later covering up most of the surgery. The bumper will have to have four inches taking out on either side of the license plate feature. Sectioning may be a little tricky. Three inches will be removed from the front fender, just under the chrome trim. Chopping down the cowl is straight forward. For the doors and quarter panels there is a relatively flat spot through the body section that will have the height removed from that ends in the tail fins. At the back of the car the rest will have to come out of the space between the trunk opening and the bottom edge of the car at the bumper. I think it’s best to do it along the bottom so I don’t have mess with modifying the length of the trunk or trunk opening. Tucking in a pair of trapezoidal exhaust tips to the bumper will be a nice addition to the concept car look. Modifications to the rear end. 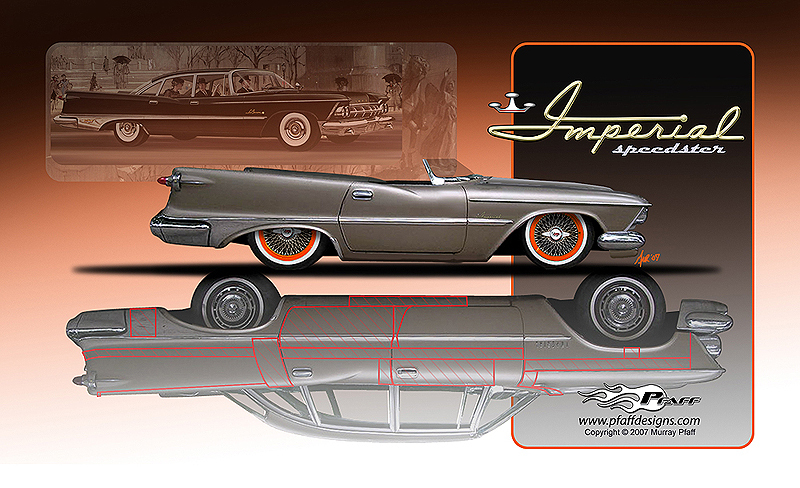 Overall the new “Imperial Speedster” retains all of the great design cues created by Virgil Exner and his staff. It retains most of the great chrome bric-a-brac from the era and certainly exudes the style of the burgeoning rocket age. It is all Imperial; I have just cut out all of the ugly creating a stylish, fun, little sports-roadster. As my friend Ken Fenical of Posies says – “Anyone can restore a car, but it takes a real man to cut one up!” It certainly sounds like an executable plan, now it’s time to man up.